Mr. Chancellor, the lives of hundreds of thousands of African refugees have been transformed by new opportunities and hope, thanks to the work and wisdom of Marangu Njogu. A visionary leader in the development of refugee education, his efforts have focused on the world’s largest refugee settlement in the region of Dadaab, Kenya. As the executive director for the past 10 years of Windle Trust Kenya, Mr. Njogu has been responsible for the implementation of educational programs from primary to university levels, including special education programs for girls and teacher education programs. His remarkable humanitarian odyssey began in 1991, when after obtaining a Master’s degree in Education from Manchester University, he returned to his homeland as a lecturer at the Kenya Institute of Special Education. He subsequently began a series of escalating education and community service leadership positions with CARE Kenya, culminating in his appointment in 2001 as program manager of CARE’s Refugee Assistance Project. It was in this capacity that Mr. Njogu successfully oversaw a number of local area projects and assumed responsibility for the provision of education for approximately 30,000 students; community, water and sanitation services for over 140,000 inhabitants, and microfinance support for some 20,000 clients. 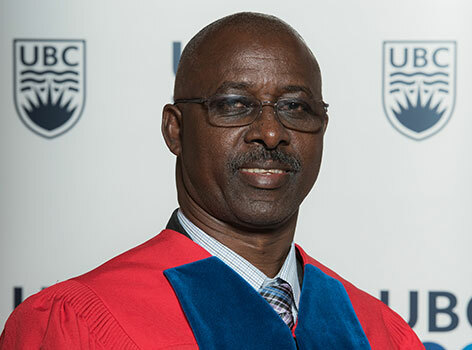 In 2006 he assumed his current executive directorship, where his extraordinary program development efforts have included the establishment of the Borderless Higher Education for Refugees project, which brought together a consortium of Kenyan and Canadian universities – one of which we note with pride was the University of British Columbia – to provide teacher education programs in the Dadaab camps. Mr. Chancellor, in recognition of his success in bringing opportunity and hope to severely marginalized populations, and for enabling this university to take part in these noble pursuits, I ask you to confer the degree Doctor of Laws, honoris causa, upon Terah Marangu Njogu.